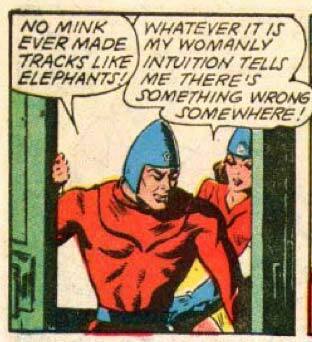 What about a particularly large mink, Bulletman? “There’s something wrong somewhere” is just brilliant. I mean, try and prove her wrong. In the unlikely event nothing’s bad happening in her city, there’s every other place in the world to consider. *ahem* That is, ‘In the unlikely event nothing bad’s happening’. Not sure how that happened. Possibly a ninja tank snuck in there and moved the ‘s when I wasn’t looking. No sane man, even one wearing a metal condom on his head, is gonna argue against the phrase ‘womanly intuition’! And what if it’s an elephant wearing a mink coat? … or a mink wearing an elephant coat! I think she’s trying to hint to him what she wants for Christmas. @ MontanaPlayer: Metal Condom? Don’t you mean Bullet condom?